© Media General. “In the Garden” by Mary Garner-Mitchell. Acrylic air brush, watercolor, pencil on paper. Editorial illustration for gardening article. 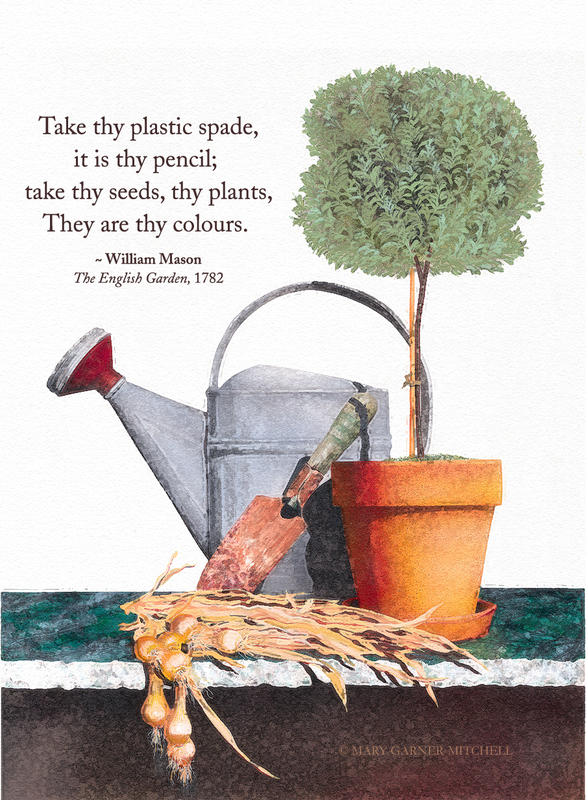 I was searching for just the right quote to fill the void in my “recycled” watering can illustration, when I came across the 18th-century lines above. While they speak to everything I feel in my bones about two of my passions (art and gardening), one word gave me great pause: Plastic? Plastic spade? What, a Colonial Walmart selling crappy tools? Indeed, I have a love/hate relationship with plastic in general. Mostly hate. I curse its existence every time I go to open any overly-protected-over-packaged-off-the-shelf product, or realize our plastic recycling bins are (once again) overflowing. I know it’s never going away, literally — as a noun that is. Which brings me around to my love/hate relationship with words. I often I find the English language just plain stupefying and as I stumbled today, I wonder how anyone learns it completely. Of course, I am fully aware Mr. Mason’s now antique description is just one example of how our pliable vocabulary bends and stretches over the centuries. But his use of “plastic” made me realize how far down the definition chain this otherwise perfectly placed adjective has fallen. In the context of this quote, it is at the very bottom! “Write” on! How can I hate such a great word? Plastic: reclaimed, reused, recycled!